Happy Monday! Today, I am sharing a card using the Going Global stamp set. I am so sad that this stamp set is retiring. 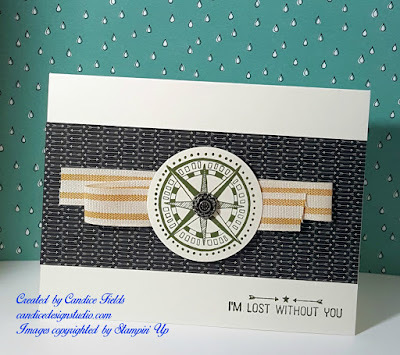 1) Fold the 5 ½ x 8 1/2” piece of Very Vanilla cardstock in half to make a 4 ¼ x 5 ½” card. 2) Cut a piece of the black printed designer series paper (DSP) to 2 ½ x 5 ½”. 3) Adhere black printed DSP to front of card using adhesive. 4) Stamp the greeting “I’m Lost Without You” in Mellow Moss ink at the bottom right corner. 6) Ink the compass stamp in Mellow Moss ink. Punch out with a 2" circle punch. 7) Use Paper-­Piercing tool to poke hole into center of the Mellow Moss compass. Place small “compass like” Antique Brad into center of the compass and fasten the ends. 8)Place two Stampin’ Dimensionals on back of compass, one towards the top and the bottom trying to stay clear of the folded ribbon.